When any player within Ma Dai's attacking range recovers blood, he can attack them. This attack in unaffected by armor. If it hits, Ma Dai can then compete with the target. If he wins, the target loses one blood. If Ma Dai loses, he cannot attack until the end of his next turn. If the attack hits, it causes the normal amount of damage that it would during Ma Dai's turn. 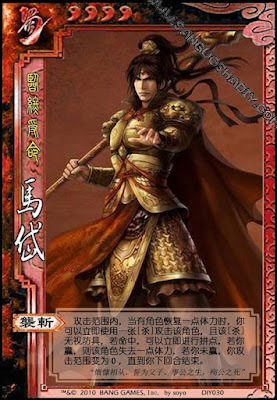 Ma Dai cannot compete with the target if they do not have any cards.